This seven branched lampstand has great significance and symbolism in both testaments. It originally had a central stand (trunk or shaft) with three other branches proceeding from each side2 each with a small platform at the top. Each platform was able to hold a lamp bowl filled with olive oil with a wick spout. Today the Menorah is portrayed with seven candles rather than seven lamps.3 Such lampstands and images of the menorah were prolific in every form in ancient Israel. Besides actual metal lampstands, images of the Menorah are found in pottery, tapestry, engravings, mosaic floors, buildings, literature, artwork and so on. The Menorah (Hebrew for “lampstand”) is called “The lamp of God” in I Samuel 3:37 and this may especially refer to the central lamp. All the lampstands were equal in height with the central trunk and all had significant decorations described in scripture each symbolic of life, first fruits, and so on.8 These symbols carry on nicely into the New Testament. The Menorah holds multiple symbolic meanings. As with most things, the Menorah was to be a reminder to Israel of their God and all He meant to them. It represents the Holy Essence of God; God as the creator of all things in seven days; the tree of life; God’s “breath” which is also called The Holy Spirit in the New Testament and the menorah is seen in Revelation as the Seven Spirits of God9; His truth (as light is a metaphor for truth throughout the Bible); thus His word, (“…A lamp to my feet and a light to my path”); His righteousness, law and judgment; sometimes seen As representative of the burning bush as seen by Moses; and is seen further in the Book of Revelation as representative of seven churches;10 and so forth. Messianic King. 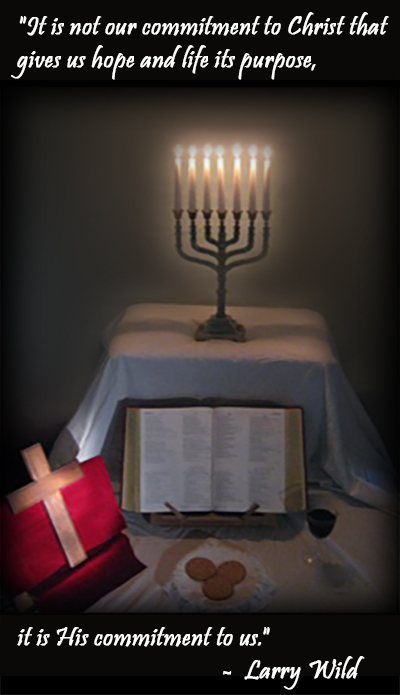 In essence, The Menorah can be seen as God’s holiness and the holiness of everything The olive oil that fuels each lamp is also symbolic of the Holy Spirit, and of the anointing of the and everyone else He touches (gives His light to). It stands in the highest place in the picture representing the sovereignty and love of God over all time, creation and history. The illustration to the left has inaccuracies.13 For example, each of the six stems is to have three cups, bulbs and flowers as it ascends to the top, one being where the stem meets the trunk, the second halfway up the stem and the third at the top finished with a flat surface upon which a gold oil lamp would be placed. The impression is that the menorah grows progressively out from these flowers. The base is an artist’s conception taken from the arch of Titus in Rome where an engraving of the Menorah taken from the temple can be seen. The base itself is not specifically described in scripture. Some have noted that the shape and stems of the Menorah bear a certain resemblance to a plant found in Israel called Salvia Palaestina. The Temple Menorah was quite large, and estimates place it at some three feet tall and two feet wide. This can also be seen in the Titus Arch. It was made from seventy-five pounds of pure gold and hammered into a one piece unit except for the lamps themselves. 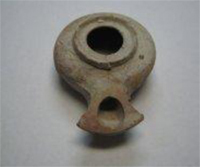 An ancient pottery Herodian oil lamp from the time of Jesus.14 These lamps were only three or four inches long. The one pictured here may not accurately represent the type of lamp on the Temple Menorah as there were many styles of lamps in ancient Israel, some quite simple such as a round bowl with a pinched end to hold a wick. This particular lamp was made on a potter’s wheel and the spout formed before it was fired. 3See: Zechariah 4:2; II Chronicles 13:11. 6See also: Hebrews 9:9, 9:23-24, 10:1 and Colossians 2:17. 7See also: Exodus 27:20-21; 39:37; I Chronicles 28:15; etc. 12Matthew 5:14-16; See also: Luke 11:36; John 3:21 etc. 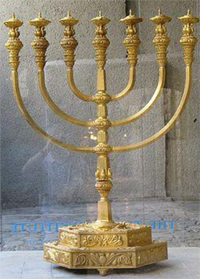 13Reproduced from “Wikipedia” online, “The Temple Menorah”. Copyright 2018 Bob Stewart | All Rights Reserved | Powered by Jireh Communications Inc.